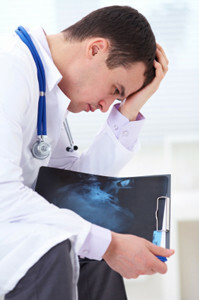 Can I File a Lawsuit Against a Doctor for Medical Negligence? When you go to the doctor’s office or the emergency room, you trust that you will receive the care necessary to treat your injury or illness. In short, you trust your doctor to make you better when you have a health problem. Still, sometimes doctors and other medical professionals betray that trust and may actually make your condition worse through negligence. A medical error during diagnosis, prescription and/or treatment can cause physical injuries or allow an illness or condition to progress. Serious mistakes can cause permanent disability and even wrongful death. If you sought treatment from a doctor but suffered negative results due to medical negligence, then you may be able to file a legal claim to recover compensation for your injuries and losses. However, these cases are notoriously complex, as not every doctor’s error may satisfy the requirements for a medical malpractice lawsuit. Below, our Maine injury attorneys explain what acts may constitute medical malpractice and describe the elements of a lawsuit. Additionally, we also discuss the damage caps that apply to medical malpractice claims in Maine. These laws limit the amount of compensation that medical injury victims and/or their families may recover. However, every case is different, so if you have a specific question about medical negligence, do not hesitate to ask the lawyers. Otherwise, consult our local listings to find an attorney near you. Existence of a doctor-patient relationship. This means that you saw the doctor in a professional capacity to receive medical treatment. The doctor failed to provide a reasonable standard of care. Most medical malpractice cases hinge on the definition of “standard of medical care.” Broadly speaking, this is what your doctor should have done to treat your injuries or illnesses. However, the correct course of action varies from situation to situation and depends on the information that was available. Usually, your lawyer will bring an expert witness to establish what the standard of care was in your specific case, based on industry standards and the actions another qualified doctor would have taken. The breach of the standard of care caused you harm. You and your lawyer must establish a connection between the doctor’s medical negligence and your injuries. While this may seem straightforward, this connection can be difficult to demonstrate in certain cases. For example, in some situations, an injury or illness may not have been preventable even if the doctor had not been negligent, making a claim more difficult. You sustained real damages. Finally, you must have experienced physical and/or financial injury to file a medical malpractice claim. If you did not suffer harm, then you may not have a case, even if a doctor or other healthcare worker made a serious error. Misdiagnosis and/or failure to diagnose. Before you can receive treatment, a doctor must observe your symptoms, listen to your concerns and perform the proper tests in order to form a correct diagnosis. If a medical worker fails to diagnose your condition, then you may not receive the treatment you need. On the other hand, if you are diagnosed with the wrong condition, then you may receive treatment that you do not need and which may harm you. In either case, your true illness or condition may worsen, possibly beyond hope of treatment. Surgical errors. An error during surgery can cause severe internal and/or external injuries, including brain and/or nerve damage. This can result in permanent impairment, loss of limb or dangerous infections. In some cases, a second surgery may be necessary to repair the damage. Prescription medication errors. Sometimes, a doctor may prescribe the wrong medication to treat your condition. However, a pharmacist may also negligently fill your prescription, giving you the wrong medication or the incorrect dosage. This can cause severe side effects, poisoning and/or wrongful death. Additionally, doctors and pharmacists should consult your medical history and current medications to ensure that the drugs do not interact negatively. Incorrect reading of lab results. Medical professionals like radiologists must take care in interpreting test results. Otherwise, the result may be misdiagnosis or unnecessary treatment. Failure to properly monitor a patient. Doctors and nurses must monitor certain patients closely, especially during surgical procedures and childbirth. Failure to do so may cause debilitating injuries, including preventable birth injuries. Any healthcare professional may commit medical malpractice, including doctors, specialists, nurses and pharmacists. What Are Medical Malpractice Damage Caps in Maine? Many states limit the amount of compensation you can recover from a medical malpractice lawsuit. In most cases, damage caps apply only to certain types of damages. Economic damages include all compensation you receive for measurable expenses. This may be medical bills for past and future treatment, and lost wages. Usually, economic damages are not capped. While Maine doesn’t have a specific medical malpractice damage cap–meaning that, in theory, there’s no limit on the monetary award you can recieve in court–this applies only to suits not involving allegations of wrongful death. In those cases, damages are capped at $500,000. However, this category does not include compensation for permanent disability, disfigurement, paralysis, loss of limb, or blindness. Medical malpractice claims are usually complex, since they usually require the input of at least one expert witness and an understanding of the medicine involved. Therefore, if you have a question concerning medical malpractice, then you should ask a lawyer. Or, if you need to find a qualified medical malpractice lawyer in your area, consult our local listings.